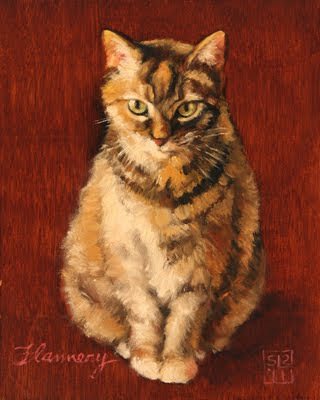 This painting is hommage to a lovely little cat named Flannery. She was a longtime companion to a good friend of mine. Unlike many pets whose unique relationships with their human companions remain private and sometimes incomprehensible to the outside world (I speak from experience) Flannery was beloved by everyone who knew her. She will be missed. Hex, this painting is my birthday gift to you. Surprise! If it's dry, I'll put it in your hands on Sunday.